One of my favorite plants in the flower garden is the purple coneflower (echinacea purpurea). It's lovely, of course, the tall, colorful blossoms provide a showy display from late July through most of August. The local deer don't eat them either which is always a plus for things grown outside the garden fence. Beyond its beauty purple coneflower is a medicinal powerhouse. 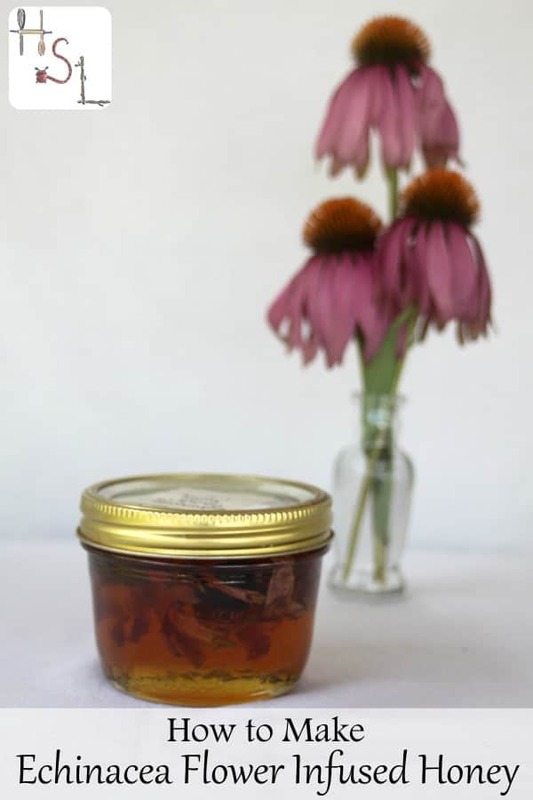 Harness some of that healing power by making echinacea flower infused honey for a sweet cold-busting home remedy. 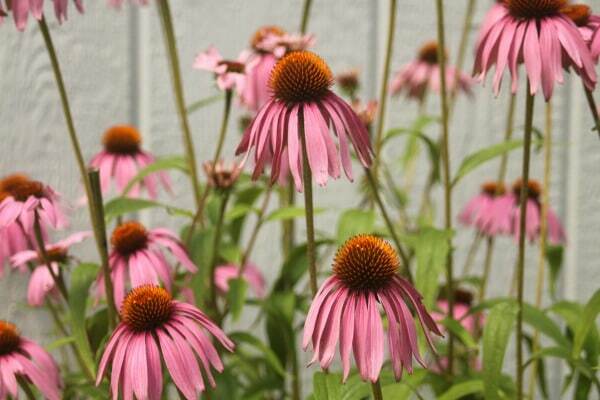 The echinacea root is used most often in tinctures and pills found commercially and used by many home herbalists. However, the entire plant carries some medicinal energy, including the flowerheads and leaves. Native Americans historically used every part of the plant in different applications from smoking to teas to chewing on the roots and more. Echinacea has been studied and found to activate the bodies immune system making it an ideal choice for fighting colds. Cut a few flowerheads from the plant. Wash and allow to dry. Once dry, stuff the flowerheads into a jar, filling it about half full. Pour liquid honey over the flowerheads filling the jar to about 1″ of the top. Give it a good stir and remove any air bubbles. Cover the jar with a tight fitting lid and let sit for about 4 weeks. Shake the jar or turn it over now and then to keep everything moving around and infusing well. At the end of the 4 weeks, strain the flowerheads from the honey and store the infused honey in a clean jar. To use: simply take a teaspoonful a few times a day or add to tea at the first sign of a cold to help the symptoms pass faster. Always check with a doctor or trained herbalist before using echinacea. It has the potential to interact poorly with some prescription medications, so double check. People with auto-immune disorders are generally cautioned not to take echinacea because of its ability to stimulate the immune system. There have been several studies about echinacea and pregnancy, it is considered low-risk but again seek professional advice before ingesting while pregnant or nursing. This summer as those coneflowers bloom, cut a few and stock the herbal medicine cabinet with echinacea flower infused honey. Use this simple remedy to help fight flu season and sweeten up some of those medicinal teas to keep the body healthy. Great recipe…Please note that honey should not be mixed in beverages which temperature is above 37 degrees Celsius as it looses its healing capacities if mixed with hot beverages… So make your tea, let it cool down and then add the honey. Great idea!!! Hello! I’ve tried this recipe a few times but the honey always gets too thin. Any suggestions? Also, are white flowers the same as the purple flowers in your picture? Anytime you put something fresh in honey, it will have a tendency to thin – the water from the plant seeps out into the honey. I would store it in the fridge if it gets thin. There are white varieties of echinacea but there are also hybrids. I know the purple is considered to have the most medicinal qualities but that doesn’t mean the white is without either.